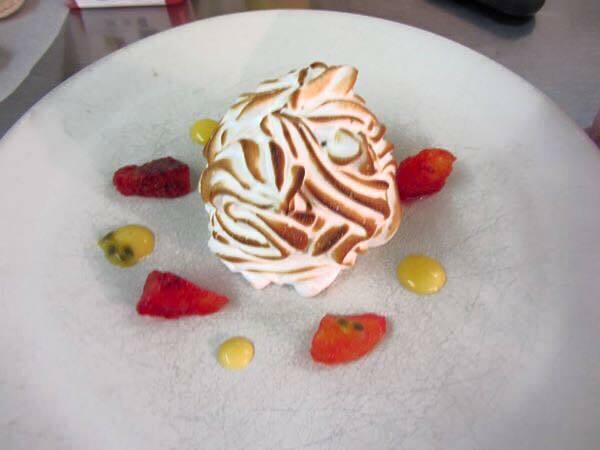 The Peat Inn is owned by award winning Chef and columnist Geoffrey Smeddle and his wife Katherine. With Geoffrey at the heart of the kitchen and Katherine’s warmth and care filling the restaurant, they have been successful in building on the very fine reputation of one of Scotland’s most cherished destinations. 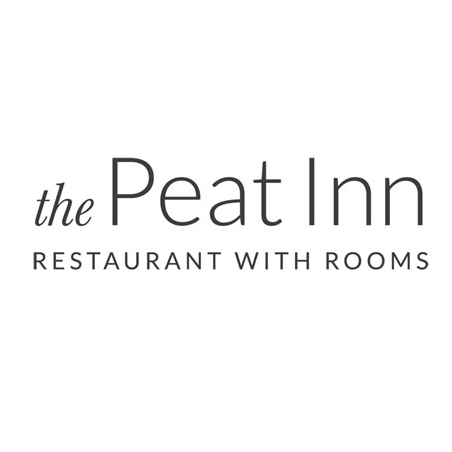 The Peat Inn is located within a tiny village of the same name about six miles from St Andrews. 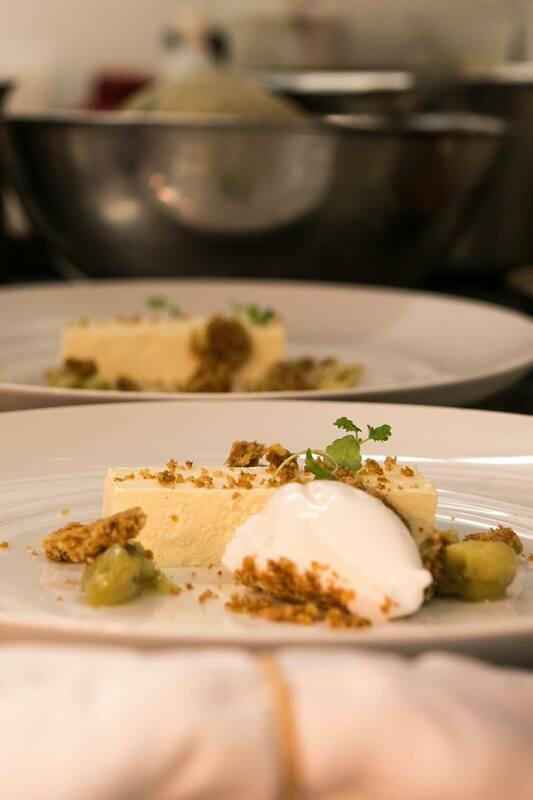 It is located within what was originally a 17th century coaching inn, and rose to culinary fame in 1984 when it first gained a Michelin star under David Wilson, which it retained on a somewhat erratic basis for many years, on and off. 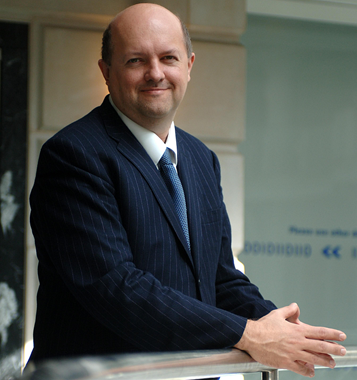 In 2006 the property changed hands and is now owned by Geoffrey Smeddle, who gained the Michelin star in 2010 and has retained it ever since. The dining room is split into three sections, seating between 38 and 50 diners depending on the table configuration. 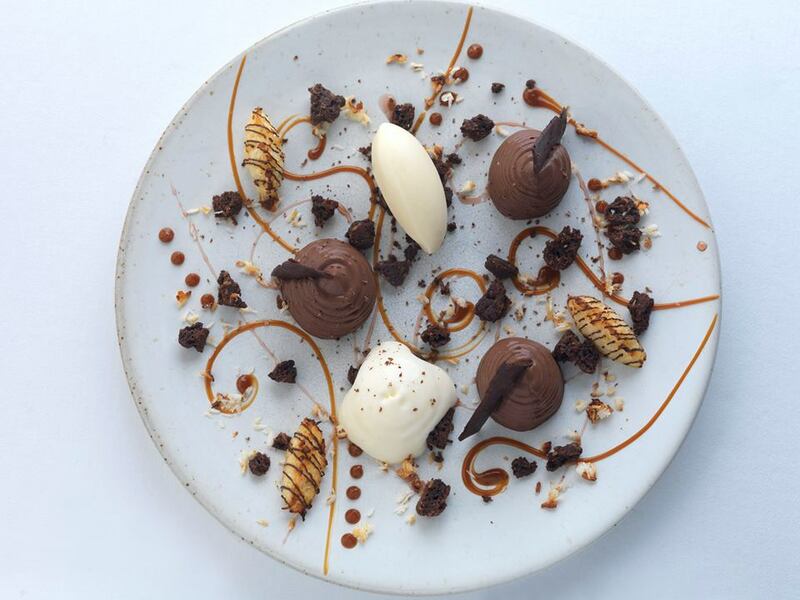 There was an a la carte menu in addition to a tasting menu at £70, and a shorter fixed menu at £50. The room was carpeted with well-spaced tables covered in carefully ironed white tablecloths, the overall noise levels being moderate. The wine list included labels such as Chateau Pesquie Viognier 2015 at £30 for a bottle that you can find in the high street for £10, Zind Humbrecht Urban Pinot Gris 2005 at £73 compared to its retail price of £38, and Michelot Les Charrieres 2006 at £90 for a wine that will set you back £45 in the shops. Bread was made from scratch in the kitchen, a choice of sourdough and slices of raisin and pumpkin seed bread. The latter was particularly good, with excellent flavour and texture (16/20). A pair of nibbles comprised courgette flan with red pepper and black olive, and a seaweed cracker with mussel mousse and sea purslane (15/20). A final nibble was a casserole of squid and watercress, a mix of finely diced and deep-fried squid with a watercress sauce, which worked very well indeed (16/20). Cured salmon with potato crust came with seared Orkney scallop, smoked halibut cream and keta (aka chum salmon or dog salmon). The fish was lightly cooked, the potatoes crisp, the scallop sweet and the dish enjoyable overall (16/20). Lobster came with cannelloni of mouli and a peanut sauce. This was particularly good, the shellfish tender and the sauce very effective, the flavour of the nuts coming through strongly; perhaps this sauce was an influence of the time the chef spent in Asia in his youth. The radish cannelloni provided an extra flavour note to balance the shellfish and the powerful sauce (17/20). I tried an intermediate course of salsify "cannelloni" with venison ragu. 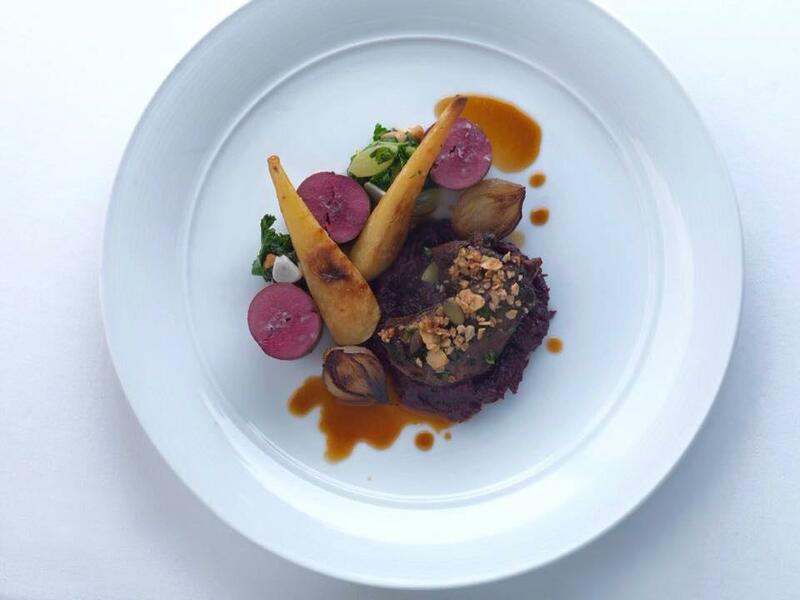 The salsify, with its hint of oyster flavour when cooked, provided a base for a rich, dark sauce of the deer, and provided an interesting balance that worked effectively (16/20). For the main course, turbot was excellent, precisely cooked and served with tender langoustine tail, Jerusalem artichokes and romanesco (a kind of broccoli) with a thermidor sauce The romanesco retained its texture well and provided an earthy balance to the seafood (16/20). Wild roe deer was cooked pink and came on a bed of wilted watercress, with prunes and salt-baked celeriac, a purée of celeriac and pear, hazelnuts and an Armagnac sauce. 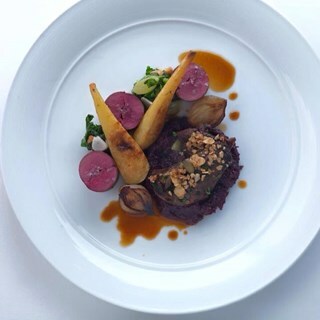 The venison had good flavour and the accompaniments provided a good counterpoint to its richness, the earth celeriac and the prunes and nuts proving to be effective complementary flavours (16/20). Pear and apple croustillant came with caramel and an almond ice cream. The almonds in particular worked well, bringing their distinctive flavour and firm texture to contrast with the acidity of the fruit. The only issue that I had was with the croustillant cylinder itself, which was not really crisp (overall 15/20). Soufflé of mango and passion fruit was excellent, served with salted banana ice cream and warm pistachio madeleines. The soufflé itself was evenly cooked and light in texture, the acidity of the fruit working nicely with the madeleines (17/20). Coffee was from a supplier called Myrtle in Kircaldy, and the blend of arabica beams from Honduras, El Salvador and Uganda worked well, the overall result being rich and quite deep in flavour. Service was charming, the waiters friendly and attentive. The bill came to £115 a head, with an excellent bottle of Bonny Doon Cigare Volant and some additional wine, if you stuck to a basic bottle then a typical cost per head might be around £100. I enjoyed this meal at Peat Inn very much, the menu appealing and interesting and the technical skill high, making the best of the lovely produce available in this part of the world. The service was fantastic. We had a very friendly waiter who engaged easily in conversation and was incredibly attentive. 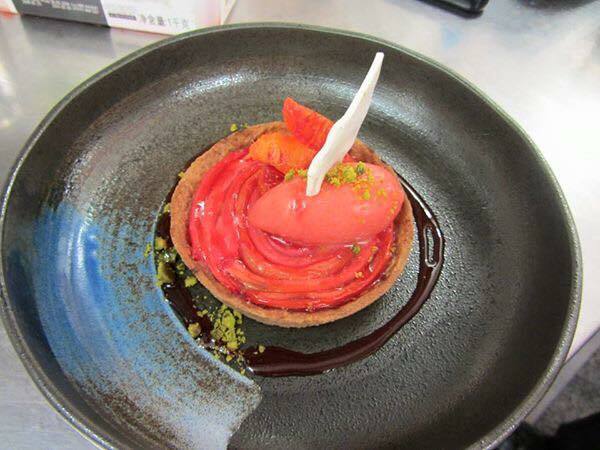 The food was also great, especially the dessert. Couldn't fault the food or the service - will definitely be back! Better than ever. And I love the new decor. Food was fabulous. Staff were brilliant. french waitress was very attentive, just lovely. But to be honest we were let down by the aumbance. Table settings were very awkward bright lighting, sorry but I just couldn't relax. But did I mention food was fabulous !!!!! We had an amazing first visit to The Peat Inn., we'll  definitely  be back! The young German girl who attended to us was a credit. Feel that the food was very good but I did feel still hungry at the end I am afraid! The helpings are just far too small. Especially at these prices. Staff are good but not excellent. Superb food and delightful service as always. We came for the food and were impressed by how excellent it was. The level of service was good but we were a bit irritated by the unctuous fussing with napkins, demonstrative table-cleaning, etc. The staff were excellent at answering our questions. The wee extras provided were equally tasty. For us this was a once in a blue moon dining experience to  celebrate a very special birthday and the first time my charges had experienced food of this calibre. All our expectations were exceeded; the venue, the ambience, the food and wine, and not least, the service. A special thank you goes to the young lady who described to us each course as she presented it in a gentle, quiet, and caring manner. An evening to remember always. Just perfect! Superb as usual. I wish you'd do a cookery book, the red pepper sauce with the cheese mousse/puff pastry thingie was exquiwite! Excellent food, delicious and well presented and as good any other 1* restaurant I've eaten at. We didn't have a bad course, and the generous cheeseboard and lovely petit fours rounded things off perfectly. Excellent food and service. Very enjoyable evening. As usual, an excellent lunch well served by all your staff. Not sure about the new decor (which affected the Atmsophere mark) but may grow on us; also we had a couple who chatted very loudly and incessantly two tables away - hardly your fault - who then had the audacity to claim they didn't like the background music!! this too impacted on atmosphere. Am looking forward to our next visit (early June for dinner) very much. Excellent service, excellent food, great wine list at more affordable prices than in Edinburgh. We are definitely coming here again. The lunch was a superb anniversary meal, cooked to perfection, splendidly presented and served. 5-star everything! Ambience, warmth of service, wine, food all excellent, and unbelievable value.